Bold Missy purchased a vintage fixer-upper, brick warehouse building in the heart of Charlotte’s Art District known as NODA. Redline Design Group was chosen to help reinvent this warehouse into a neighborhood landmark. 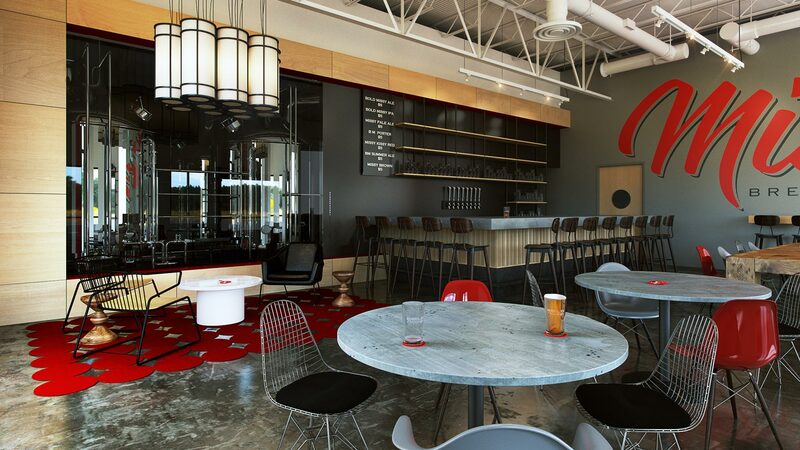 The taproom is warm and inviting with a large master-graphic logo wall, a unique bar top, creative seating and large wood/steel family-style tables for gathering with friends. The brewery equipment is visible through a large glass window. The round bottlecap theme with the signature red lipstick mark is repeated in red accents throughout the space. The historic character of the building was preserved and highlighted by keeping the roof structure and brick walls exposed.